Bank of Baroda BOB SO Recruitment Notification is out on 3rd Dec 2018 for the Candidates to fill 913 Specialist Officer Vacancy in the various departments. Should apply for Bank of Baroda Specialist Officer Recruitment Process starts from 5th Dec to 26th Dec 2018 @ www.bankofbaroda.com. Bank of Baroda SO Application Form link is opening on 5th Dec 2018. Hey, are you Interested in Bank sector? The BOB Specialist Officer Recruitment 2018 invites the application for the candidates who are completed their academic qualification. Hence, who is well in all aspects join in the BOB Recruitment Process. It is commenced on 3rd Dec 2018. So, Eligible candidates have to participate in the BOB SO Recruitment Process. There is a huge number to fill the vacancies in the various departments. Willing & Interested aspirants have to follow the rules & Conditions of the Bank Of Baroda Specialist Officer Recruitment Notification. We have enclosed the Official Notification. Have to audit clearly before applying the Particular post. The Educational Qualifications are varies based on the required the post. So, one can have to check all the Requirements of the Bank Of Baroda. If you have any confirmation visit the Official Link You may also search throughout this article. 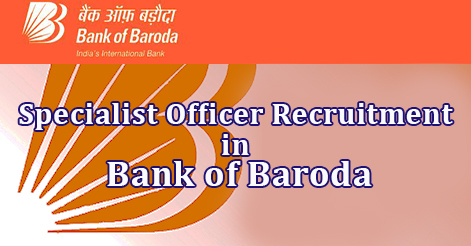 Click here to get more alerts on our main page i.e, @ RecruitmentIndia.In The latest New Bank of Baroda SO Recruitment 2018-19 with of 913 Specialist Officer jobs vacancies are added on 3rd Dec 2018 and until 5th Dec 2018, the Specialist Officer Recruitment notification application forms will build, the links will have come in active mode from 5th Dec 2018. This Bank of Baroda Specialist Officer Recruitment of 913 Vacancy is the best one for the bank job seekers who are looking bank jobs in 2018 at Mumbai, Maharastra now. BOB SO selection process is as follows. Applicants must have to follow the Age criteria to apply for the BOB So Vacancy. Pay the fee as per the norms of the BOB SO Recruitment. Here the BOB released the BOB SO Recruitment Notification to fill up the 913 SO Vacancy in BOB. They have to choose the candidates who got merit in the Written Test. Actually, the BOB releases the Scale I, II, III, IV, V SO Vacancies. Respectively, The BOB SO Selection process must be different based on the Scales. Selected candidates have the 12 months of the Probation Period. Those who are selected on the Regular basis they have the Service Bond for 3 years. For the Scale I Selection process likely, Online Test, GD/Interview. For the Scale II, III, IV, V posts must have the GD/Interview. Online is not mandatory for all the scale posts it will be based on the Count of applications. If the number of candidates submitted for the Scale II, III, IV, V posts they have the Online Test. So, fill the the Bank Of Baroda SO Application Form before the online link expires. Here, the BOB SO 2018 application form is started on 5th Dec 2018. So, The Candidates have the Written Test on will be on Jan/Feb 2019. Collect here the BOB SO Syllabus for the Specialist Officer exam. It is necessary to know the Exam Syllabus also. Make sure the All the topics before the Exam. They will be released the Admit card very soon. Participants can also get the Exam Pattern here on this site. BOB Specialist Officer Recruitment Selection process will be very tough. So, be conscious while attempting the Questions. We give all the Facilities to get merit marks through the Written Test. If you want to know the Railway Jobs the very recent updates are avail here. We are ready to give the more renovated Reports which is really helpful for you. Are you ready for the BOB SO Recruitment Process, Yes!! we give the complete process which is very helpful for you to fill the application form. So, The BOB Specialist Officer 913 Vacancy registration is beginning on 5th Dec 2018. Candidates have the time to submit the Application until on 26th Dec 2018 . Actually, the Aspirants have to fill approximately 913 Specialist Officer Vacancy in BOB. Participants have the great chance to participate in the Bank Of Baroda Organisation Competition. Every year they released the huge vacancies. This year also they make the effort to Organise the recruitment process to give the chance to the contenders. Who is waiting for the Bank Jobs they have the right time to get placed on this BOB. BOB gives the lots of facilities for Employers. Full fill your dreams to the Job in the Bank sector. If you want to know the More Chances Related in the Banks. Click here to get the Bank Sector Jobs. We give the recent updates on this main page.